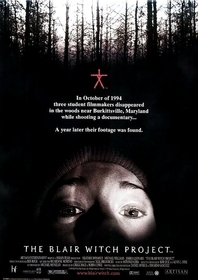 The Blair Witch Project (1999) is a horror film that examines the very nature of fright. Directors Daniel Myrick & Eduardo Sanchez seem to understand that what scares people - what truly, undeniably scares people - is something far more interesting than stalking madmen, bloodied teenage corpses, or creatures from the great beyond. This is not to say that those horror film staples aren't worthwhile and often scary, but rather that goose-bumps are best administered by the underlying creepy-crawlies of primal instinct, genuine loss, and - most important to the film - the unknown. The film begins with three documentary filmmakers - Heather Donahue, Joshua Leonard, and Michael Williams - as they search the woods of Burkittsville, Maryland in a quest to uncover the truth about the mythical Blair Witch for a documentary that they are producing. To give away any of the events that transpire throughout the trio's journey would be criminal, but I will mention that the group finds themselves lost and alone in the middle of nowhere, and that they are tracked and harassed by an unknown someone - or something. Myrick and Sanchez present the film as the lost footage of a real troupe of filmmakers, which fortunately it is not. Nevertheless, the gimmick pays off. 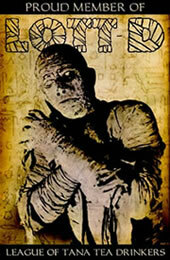 The film seems to unfold almost by accident, with every terrifying scene building up to an even more unnerving result. As a pleasant side-effect of the mostly improvised dialogue, and a story-line hidden from them by the directors of the film, the actors seem unbelievably real and genuine in their performances. The on-screen characters of Heather, Josh, and Michael are all very intriguing and sympathetic as a result of the pitch-perfect performances by their real-life counterparts. There are no cliche-ridden teen "types" to be found. Don't let that last comment scare you casual horror fans away. In regard to why the film is so effective in both its "boo" moments and the underlying suspense that glues the narrative together, the filmmakers have done an incredible job at taking the natural wooded setting of the film and making it come alive. The film's diegetic environment literally crawls with menace. Everyday items such as water, trees, twigs, and rocks become the targets of Myrick & Sanchez's horrifying affections. The brilliant thing about the way in which the directors scare the hell out of their audience is that they tap into fears that are not taught (the perversity of the serial killer or the nature of the angry ghost), but rather those that are inherently present in the psyche of human beings. Industry is our friend, nature not so much. I should mention here that although the film is undeniably creepy, it is not - I repeat, not - filled with gore and slasher-style killings. I find the previous fact to be one of the most wonderful and refreshing things about the film. To better explain why this makes The Blair Witch Project all the more effective, look at it this way: If you knew that a killer was in your house, looking for fresh meat, would you rather be able to see him, knife in hand and ready to slash, or would you prefer to simply hear every footstep of the invader, unsure of where or when he will strike? If you chose the second option, then Blair Witch is not the film for you. My point is that Sanchez and Myrick understand how much the unknown, the unseen, and the anxious fear of the unexplained can gnaw at the nerves of their viewers. This film exploits that fact and is all the more rewarding and terrifying because of it. I know that many folks disliked Blair Witch upon its initial release because of the hype that surrounded the film's first run screenings. If you were one of those people, I beg you to see it again without the pretentious critical rumblings and long lines at the box office that accompanied the film's theatrical release. Go home, pop in the DVD, turn out the lights, and just try not to look over your shoulder. The film is maddeningly engaging and understands exactly what makes our heart rates rise. On the other hand, if you've never seen the film, what are you waiting for? If you don't find the last fifteen minutes of its running time one of the most unsettling experiences of your film-going life, then you need to check your pulse.